A delicious cake that is perfect with a cup of coffee! Using an electric mixer, beat the butter and 1 cup of the sugar for 3 to 5 minutes on medium-high speed, until light and fluffy. Reduce the mixer speed to low and add the eggs one at a time, beating well after each addition. Add the sour cream and vanilla, and mix until the batter is smooth. Slowly add the dry ingredients to the batter and mix just until combined, using a rubber spatula to fold in any flour that needs to be incorporated. In a small bowl, combine the remaining ½ cup sugar and the cinnamon. Spread half of the batter evenly into the bottom of the pan. Top with half of the peaches, then sprinkle with two-thirds of the cinnamon sugar. Drop the remaining batter on top of the peaches in small mounds, then use an offset spatula to gently spread it into an even layer, covering the peaches. 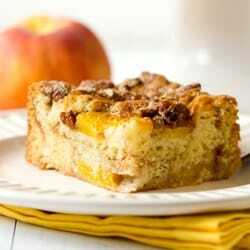 Arrange the remaining peaches on top and sprinkle with the remaining cinnamon sugar and the pecans.